Justin Porcano created this Protean chair to allow the user to create the atmosphere that they were wanting at any given moment. 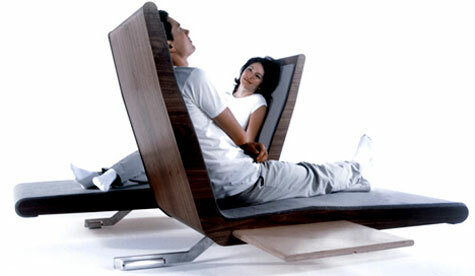 The Protean chair can be arranged as a love seat with two end tables or if you wish, you can slide the chairs apart and create two separate seats with a table in between. 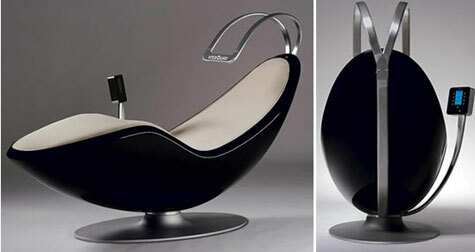 Panton Relaxer is designed by the famous Danish designer Verner Panton who has enjoyed a renaissance in the past few years. An advocate for free and outspoken “spage-age” living throughout the 1960s and 70s. Many of Verner Pantons objects are today destined to reach the status of “design icons of the 20th century”. In one sweeping curve, Panton has accentuated the art of seating, which is ergonomically fit to anybody size and posture. No matter what you do, you can be relaxed the whole day through. Our neck and shoulder massager conveniently shapes to your body for the most relaxing vibrational masssage ever experienced. The SQUSH? micropedic neck cushion is padded with thousands of micropedic beads for your ultimate comfort.